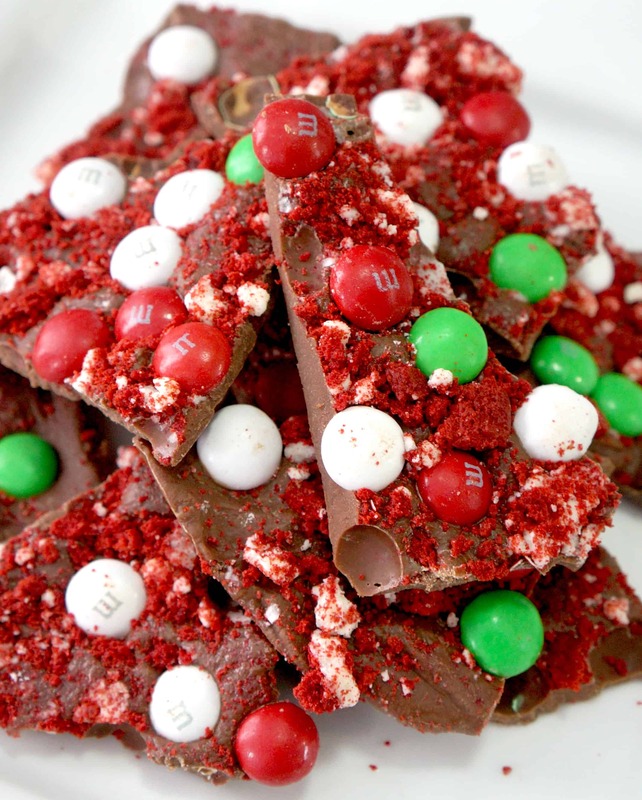 This Christmas Bark with Red Velvet Cookie is the perfect easy holiday dessert. It is so simple to make and the colours are so festive. Christmas is coming up fast now. All the Christmas goodies have already been on the store shelves for way too long now and I have totally been slacking on my shopping and baking. I’m actually really excited for Christmas this year. Even though it’s actually my daughter’s second Christmas it’s the first one where she’ll actually be old enough to have some idea what’s going on. Last year all she cared about was the wrapping paper. I finally got around to starting my Christmas baking and this bark is the first thing I made. I love barks because they are simple and don’t use a ton of ingredients. 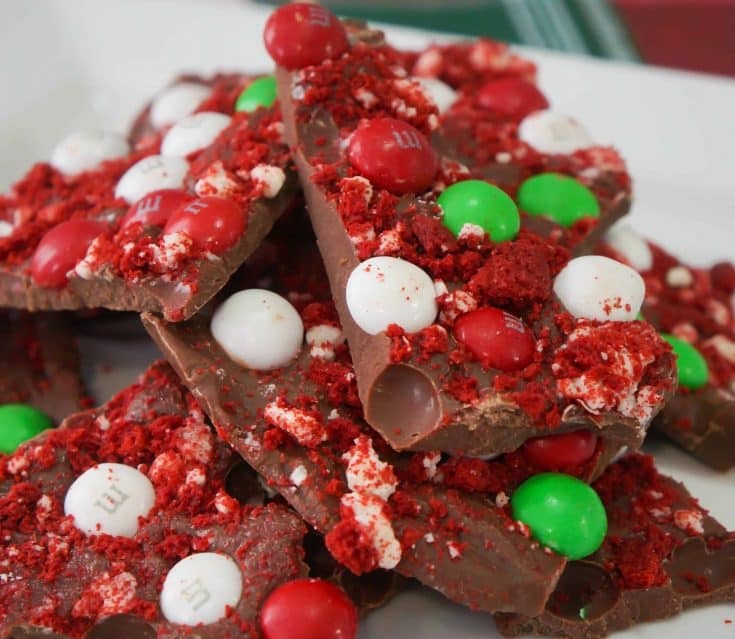 I used milk chocolate chips and margarine for the base and topped it with crushed Great Value Red Velvet Cookies and Mint Christmas M&Ms. I was inspired to come up this recipe when I was in the cookie aisle at Walmart and noticed that they have their own Red Velvet Cookies. They looked really good and I was determined to come up with a way to use them in a recipe. And bonus this the perfect time of year to be using red cookies in a dessert. I am so happy with how this bark turned out I love the combination of the mint chocolate with the cookies. The Red Velvet Cookies are actually amazing. I like them even better than Oreos. 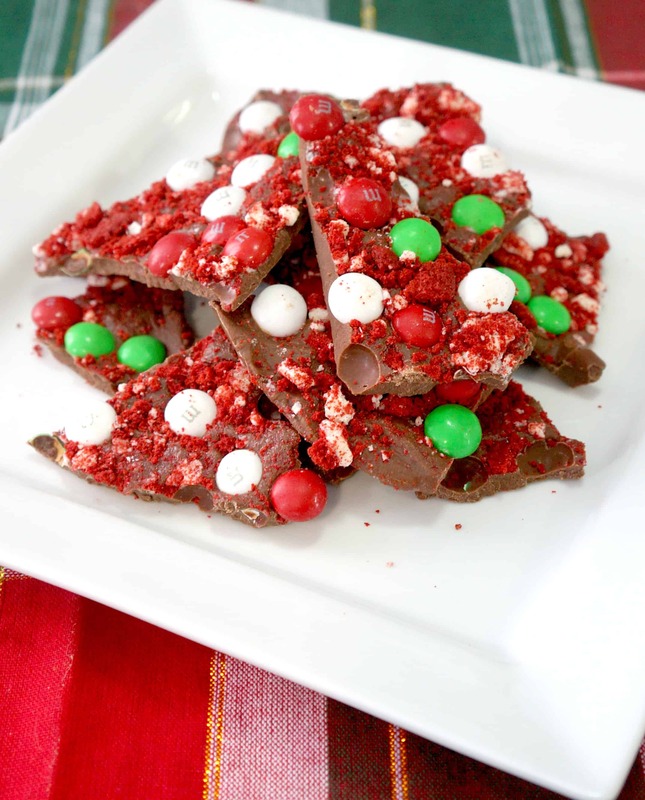 This Christmas Bark with Red Velvet Cookie is perfect for serving at your holiday parties and giving as a gift. If you are looking for more holiday dessert recipes check out Orange Chocolate Fudge with Toffee Bits, Easy Chocolate Peanut Butter Fudge and Peanut Butter Ritz Bits Toffee. Place red velvet cookies in ziplock bag and break into pieces using a heavy pot. Put chocolate chips in a microwave safe bowl, microwave on high for a minute and stir. Continue microwaving and stirring in 30 second intervals until chocolate is completely melted. Melt the margarine and then pour into the chocolate bowl stirring well. Pour chocolate mixture onto foil lined cookie sheet and use your hands to press it out evenly over the pan. Sprinkle cookie pieces and M&Ms over the chocolate and then press them down into the chocolate. Place the pan in the fridge to chill for at least an hour before breaking into pieces.